Point Pleasant’s Madison Hatfield (8) goes up for a kill attempt over Wahama’s Hannah Billups (11) and Lizzy Mullins (25) during Monday night’s volleyball match in Point Pleasant, W.Va.
Wahama’s Lizzy Mullins (25) goes up at the net over Point Pleasant’s Lanea Cochran (11) during Monday night’s volleyball match in Point Pleasant, W.Va.
POINT PLEASANT, W.Va. — Playing in “The Dungeon” gymnasium for the first time this season, the Point Pleasant High School volleyball team went on the attack against the visiting Wahama White Falcons. That’s because the Lady Knights, in amassing 42 kills, completed a straight-games sweep of their Mason County rivals on Monday night —winning 25-5, 25-18 and 25-15. Of those 42 kills, the PPHS front-line trio of Lanea Cochran, Brenna Dotson and Olivia Dotson combined for 27, as the Lady Knights never had much difficulty — either tipping the ball easy or spiking it down hard. Cochran, en route to a match-high 15 kills, collected six in the opening game and five more in the second. Brenna Dotson, who followed with 12, delivered five apiece in each of the final two sets. 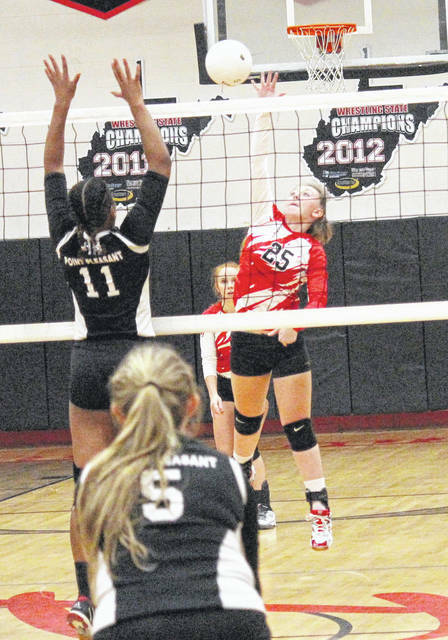 With the win, the Lady Knights extended their winning streak to two— having also swept Ohio Valley Christian School whom they hosted on Tuesday — last Thursday. 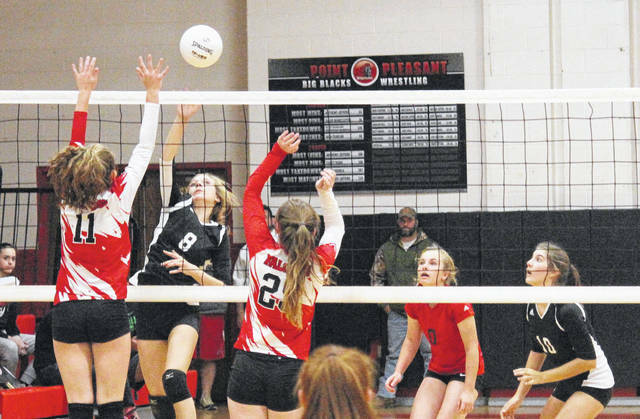 Point Pleasant is now 14-3, while Wahama — which also lost in straight games to the Lady Knights on Sept. 25 — fell to 4-18. In addition to Cochran and Breanna Dotson, Olivia Dotson hammered down seven kills, while Gracie Cottrill chalked up four. Both Cottrill and Olivia Dotson served as the setters against the White Falcons, and amounted 16 assists apiece. Cochran also had three solo blocks from her middle hitting spot. While Wahama held leads as large as 5-2, 6-3 and 7-4 in game three — and as late as 7-6 —the Lady Knights notched 21 of the final 29 points to win going away. Speaking of winning going away, Point Pleasant was never seriously challenged in the first game. While the White Falcons trailed just 5-3 thanks to three Lady Knight errors, it was as close as they would get. A Brenna Dotson kill and an Olivia Dotson ace made it 8-3, before a Point hitting error made it 8-4. From there, five consecutive points stretched the lead to nine (13-4), before the White Falcons forged their only other point to make it 13-5, which was a kill by Lizzy Mullins. After a sideout on a hitting error, Brenna Dotson served for a dozen straight points to end the game, including a pair of aces. The Lady Knights then stormed out to a 5-1 advantage in the second set, but four straight Point Pleasant errors — combined with a Gracie VanMeter kill — put Wahama ahead for the first time in the match. But between the two ties at 6-6 and 7-7, the Lady Knights regained the lead on a Cottrill kill — and never trailed again. A Brenna Dotson block-kill gave Point Pleasant a sideout, as three more Dotson kills along with an Olivia Dotson ace made it 13-7. Wahama had four straight points to get within two at 13-11, and later four more in a row to make it 20-17, but it came no closer as the Lady Knights scored 12 of the final 19 to win 25-18. Prior to taking an 8-7 advantage and never looking back, Point Pleasant’s prior lead in game three was at 2-1 — sandwiched between ties of 1-1 and 2-2. Brenna Dotson’s three kills, along with an ace by Madison Hatfield, put Point Pleasant in front for good — as it opened up a 21-12 advantage on the strength of seven straight points, including six off the serve of Peyton Jordan. An attack error set up match point at 24-14, as Dotson dialed up the final kill to claim the sweep. Dotson and Hatfield had an assisted block apiece, as Jordan led in digs with 13 while Cottrill chipped in 11 and Olivia Dotson nine. Mullins paced the White Falcons with five kills, as Emma Gibbs finished with four while Makinley Bumgarner garnered four aces. Wahama returns home to host Hannan, another Mason County rival, on Wednesday at 6 p.m.